Cattier Organic Moisturizing & Protective Mist naturally takes care of your skin all day long! Inspired by Asian layering, it is perfect for moisturizing the skin, boosting the action of daily skin care, protecting against free radicals and pollution. Rich in organic Damascus rose water, its double action makes it your beauty ally in your skin care routine: it soothes the skin and acts as a barrier against external aggressions. 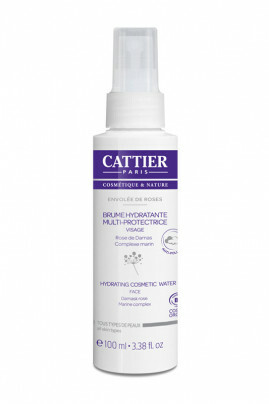 After using the CATTIER Organic Multi-Protective Mist, the skin is soft, protected and radiant! Perfect for a gentle awakening & a perfectly rested skin! MORNING: To moisturize and protect the skin from pollution, spray twice the mist on clean, dry skin, with eyes closed, at a distance of 20 cm. Let the moisturizing mist penetrate by applying a light massage with your fingers. Then apply a day cream adapted to your skin type. Ideal also after sports or a flight. EVENING: To moisturize the skin, spray 2 to 3 times the mist on clean, dry skin, with eyes closed, at a distance of 20 cm. Dab the skin gently with a cotton pad and then apply a night cream adapted to your skin type. For a refreshed skin with Cattier Moisturizing Mist! INCI: Aqua, Rosa Damascena Flower Water*, Propanediol, Glycerin, Caesalpinia Spinosa Gum, Hydrolyzed, Caesalpinia Spinosa Gum, Polygonum, Fagopyrum Seed Extract**, Plankton Extract, Phytic Acid, Phenethyl Alcohol, Potassium Sorbate, Sodium Benzoate, Citric Acid, Citronellol.